I'm trying to place this. Are we looking eastward from the west side of Chevrolet Avenue, north of the river? There eventually was a plant on that side of Chevrolet as well, but maybe it hadn't been built when this picture was created. JWilly You are indeed looking east across Wilcox st.(later Chevrolet Ave). This was the assembly plant at that time. Later when the new plant was built directly across the street,this became the body shop 2A with final assembly going on in the new plant Fisher #2. You will remember they were connected by an overhead bridge with the large Chevy bowtie lit up for all to see. That bowtie I believe is still up on a G.M. dealership on Owen rd. in Fenton Michigan. This was the building where the workers were hurling door hinges from at the police, during the 1937 sitdown strike. The Police chiefs car was also overturned in front of this building. My grandfather worked in #2 at that time. When I worked in the hole in 1973 this was still the sheet metal plant #2A . 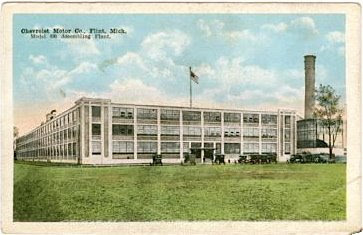 In this postcard the powerhouse is off to the right. Then as you stated is the Flint river.